DARPA just announced the details of the final round of its years-long Robotics Challenge, and boy, do they sound difficult. Not only will all the robots have to work wirelessly and without human intervention, the course must be completed all at once. If a robot falls and can't get it up, it's done. If you paid attention to the Robotics Challenge Trials a little over six months ago, you'll realize how difficult these new guidelines are. Not only were the robots allowed to be tethered to communication lines and power with wires, they also had to do just one challenge at a time. The tasks involved simple things like climbing a ladder and cutting a hole in the wall, and they varied in difficulty. But the teams always had a chance to regroup in between. For the finals, things aren't going to be so easy, and that's the whole point. 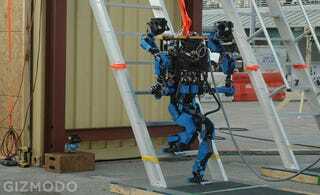 The challenge aspect of the DARPA Robotics Challenge involves building robotic technology that could be deployed in manmade and natural disaster. (We can only assume the Pentagon counts war as a manmade disaster.) DARPA said in a conference call with journalists on Thursday that the trials went better than expected so they're upping the difficultly in order to make the finals better resemble a disaster. And now, the wires are coming off. The competing robots will not only need to handle communications with their human operators wirelessly, they'll also need to carry enough batteries to stay powered up during the course. Imagine the moment in Pinocchio when the strings are cut,and the doll becomes more like a real boy. This is happening with robots, and that's awesome. DARPA is pushing the date for the finals back six months to give the 11 competing teams a little bit of extra time to prepare. The event will now take place June 5 and 6 at the Fairplex in Pomona, California. Each robot will be required to complete eight prepared tasks as well as one surprise task—again, they must finish all the tasks without human intervention—and each task will be more difficult than the last. One other piece of news from the competition: Team SCHAFT, the winner of the trials last December that's pictured at the top of this post, will not be in attendance. The team's owner, Google, decided to pull it from the competition and commercialize the technology instead. Because why work with the government when you can sell robots straight to the people?